A total of 83 civil society organisations have joined forces to launch a campaign to restore the citizenship of Chinese educationist Lim Lian Geok, which was revoked on August 12, 1961. Known as the Justice for Lim Lian Geok Movement, the coalition is urging the government to restore Lim’s citizenship posthumously. Lim — a teacher, activist and patriot — championed the cause of mother tongue education in Malaysia. On March 5, the movement delivered 63,484 signed postcards to the Prime Minister’s office, as well as a memorandum endorsed by the 83 civil society organisations in order to urge the government to restore Lim’s citizenship. The postcards were signed during a campaign which was held from May 2011 to February this year. The campaign was organised to raise public awareness regarding Lim’s work and to advocate the institution of an Education Equality Act. Passionate speaker … Lim is remembered as having a spark in his eyes during his speeches. The purpose of the Act would be to ensure that all Malaysian schools, including vernacular schools, receive fair treatment from the government. 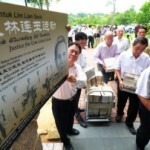 A book on Lim’s life entitled Lim Lian Geok Soul of the Malaysian Chinese was also distributed to the public during the campaign. About 3,000 books were distributed; 2,000 copies of which were in English and another 1,000 in Tamil. “I was very impressed with his humility,” said the book’s editor Dr Kua Kia Soong. Kua had interviewed Lim as part of his research on the history of Chinese schools in Malaysia. “He was more of a teacher’s unionist rather than any kind of leader. He was very unassuming,” Kua said. “Whenever he spoke about mother tongue education and the feelings that he had for Malaysian politics and civil rights, you could see the spark in his eyes. That was what struck me,” he added. Kua felt that the honour that the Chinese community gave to Lim at his funeral was unprecedented and a testament to the community’s high regard for Lim. Lim was the first Chinese Malaysian to be accorded the honour of lying in state at the Selangor Chinese Assembly Hall in Kuala Lumpur. There was also a huge procession that turned up for his funeral. Subsequent to his death, Lim was ascribed the epithet, “the soul of Malaysian Chinese”. Kua … very impressed with Lim’s humility. Photo courtesy of Kua. 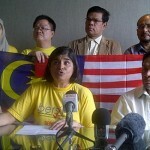 “This is somebody who was such a giant in Malaysian politics. He represented the whole Chinese community during the independence struggle,” Kua said. Kua hopes that the government would seriously consider reinstating Lim’s citizenship, although he has already passed on. “It would mean a lot to the Chinese community in this country because they look up to him,” Kua said. According to the book, Lim’s citizenship was revoked because he opposed the prevailing national education policies of his time which favoured the use of only English and Bahasa Malaysia for public examinations and imposed an age limit for secondary school students. The former policy would result in a loss of character for Chinese schools as the schools would either have to increase teaching hours for English at the expense of Mandarin or change its entire medium of instruction to English or Bahasa Malaysia. As for the latter policy, it would cause the number of students in Chinese schools to decrease as Chinese schools traditionally retained a large number of over-aged students due to socio-economic factors. Although he was aware of the consequences of his actions, Lim persisted in upholding the position of Chinese education when the government started to apply pressure on Chinese school management committees to comply with the national policy. Toh … He (Lim) believed in multilingualism. Photo courtesy of Toh. Consequently, Lim was eventually deprived of his citizenship on August 12, 1961 and his teaching registration was revoked a week later, on August 19, 1961. Based on the notice sent to Lim — which appeared as an appendix in the book — the reasons cited by the government was that Lim had “deliberated misrepresentation and inversion of Government Education Policy”, and that he had made “emotional appeals of an extreme communal nature, calculated to promote feelings of ill-will and hostility between races”. However, the book emphasises that Lim’s actions should not be misunderstood as merely being divisive or anti-establishment. In fact, there is evidence to prove that Lim encouraged the tolerance of other races and acknowledged that each race had something to gain from interacting with other races. es some of Lim’s speeches which reflect his position on a number of issues. “His (Lim’s) citizenship was withdrawn unfairly. He was very much a defender and believer of the rights of different communities to receive education in their mother tongue,” LLG Cultural Development Centre president Dato’ Dr Toh Kin Woon said. Raghavan … wants government to revamp education system. Photo courtesy of Raghavan. “He believed in multilingualism, that Malaysians should have a choice on which language their children should learn in,” Dr Toh added. The movement continues Lim’s fight for equality across all education streams in Malaysia through its proposal for an Education Equality Act. “We are all for better treatment of all (educational) groups. There are many aspects of discrimination within (the field of) education,” Toh said. According to Toh, Chinese schools typically face discrimination in terms of resource allocation and often have to source for their own funds to support the cost of school infrastructure. 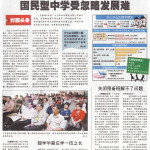 He said that it is also difficult to get licenses from the government to set up new Chinese schools. Toh says that Tamil schools also face similar problems. Toh said that the movement also hopes to see other forms of discrimination removed from the education system. In particular, it wants to see the needs of minority groups met, especially those living in rural areas. Discussing national concerns … Lim (right) in a meeting with former education minister Rahman Talib (left) and translator Zhong Min Zhang (middle). Picture taken in late 1959 or early 1960. The movement seeks to promote the concept of unity in diversity whereby each race can appreciate the language and culture of all others. He disagrees with the notion that the continual existence of vernacular schools hampers national unity. “I don’t think we should use this as an excuse to restrict the growth of education in different languages,” Toh said, adding that the more languages Malaysian children can master, the brighter their future would be. Raghavan urges the government to give serious thought to how the nation’s education system can be improved. “They should revamp the education system to meet the needs of the people. “You have to listen to the people’s views, what they actually want at the end of the day,” he said.